After having consolidated its position on the market by expanding its traditional main product - boats with outboards - Sessa Marine decided to produce larger cabin cruisers as well. Last year, when the flagship Oyster 36 was presented, Sessa Marine was enthusiastically acclaimed, even more than expected. In fact, the production manager Mr. Massimo Radice, told us the number of units produced had exceeded by 30% the estimated outlook of the previous year. These numbers explain why the yard thought of strategically launching, on the wake of the 36, a new important cabin cruiser, the Oyster 34, a smaller version of the flagship. Notwithstanding the small size, this new fast commuter is an ambitious boat with a strong personality, offering original open spaces on deck and comfortable interiors with top quality materials. 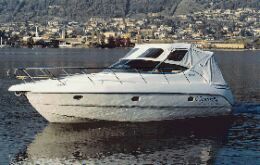 The newborn Oyster 34 is the result of the experience gained in the construction of this type of boats. The Oyster 34 was born from the cooperation of the yard's technical design department with Styleproject - a pool of designers, coming from the automobile sector, who have been working in boat design for years. 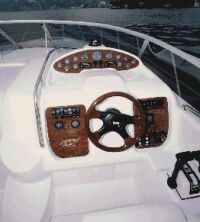 The result does not go unnoticed: the boat has a beautiful outside line and top quality interior finishing. At the helm, the Oyster 34 gives an excellent impression: the top speed exceeds 36 knots with two 230hp-Volvo Penta diesel stern drives, seakeeping ability is excellent and corresponds to the design spirit of the boat. Draft from lower tip of propellers: 2'2"
Total engines and reduction gears weight: 2x1,196 lbs. Cockpit arrangements and fittings: excellent décor. 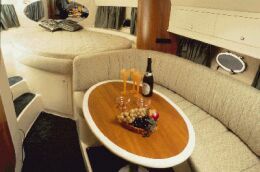 The cockpit includes a C-shaped dinette and opposite there is a special cabinet with bar, refrigerator and sink. A central table may be fitted in the dinette. 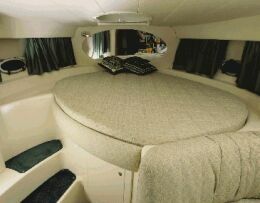 The dashboard is fitted to starboard, opposite there is another dinette with an L-shaped settee. 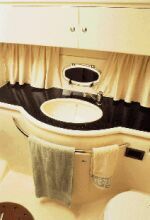 Bathroom: ample, well-lit and very well finished, it is fitted with a cabinet with sink, marine-type toilet and shower. Headroom is approx. 5'11". Optional fittings: rudder angle indicator, antifouling paint, air conditioning system, auto-pilot, dockside connection, chain counter, additional dinette cushioning and flooring, additional aft cabin cushioning and flooring, icebox, davits concealed when not in use, 3.5 kW generator, GPS Plotter, cradle, sunshade, hydraulic gangway, kitchen mirror, 10" TV set, windshield wiper, 25-watt VHF in cabin. Docking maneuverability: excellent in any conditions. Helm station: the helm station is very well protected. The three-paneled dashboard is discreet yet adequately fitted. The pilot seat may be adjusted. Electrical switchboard and plants: rational electrical switchboard belowdecks and outside battery switches.